TOP 1 EVOLUTION 10W-60 is a 100% fully synthetic motor oil formulated with the world?s most advanced additive package to provide peak performance, exceptional durability, ultimate protection, and outstanding cleanliness in extreme conditions. Extreme-performance engines and racing conditions can cause excessive wear of bearings and other engine components. 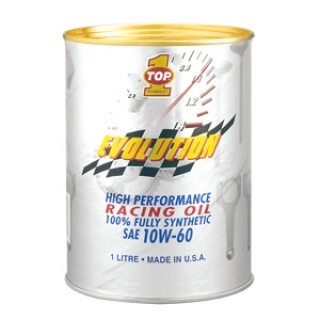 TOP 1 EVOLUTION 10W-60 has been formulated with a higher viscosity to provide exceptional bearing protection under extreme performance and racing conditions compared with lower viscosity oils.